Isaiah Stewart is ranked No. 8 overall in USA Today Sports’ Chosen 25 for 2019 after dominating the competition with La Lumiere (La Porta, Ind.) during the high school season and City Rocks (N.Y.) during the summer circuit season. That kind of play has got everyone from Duke to Michigan State to Villanova, among many others in hot pursuit. Now Stewart has agreed to give USA TODAY Sports exclusive access into his world by chronicling everything from intimate details about his recruitment to his everyday life in a blog. What’s up world, Isaiah Stewart here kicking off my first blog with USA Today! So the regular season is done for the Nike EYBL and I’m proud to say that we clinched a spot in the Nike Peach Jam tournament. I’m really looking forward to getting back to that tournament in July and trying to bring home the title! We all just have to buy-in as a team and I honestly think that we’ll be able to get it done. We just have to stick together, no matter what happens. I feel like I’ve had a pretty good season this spring. My numbers are up a lot from last season and I have a bigger role where I’m kind of the go-to guy. I just wanted to make the most of my opportunity and that’s what I feel like I did. My game has grown a lot since last year and that’s what I’ve tried to show all spring. Everyone wants to know about recruiting of course so let’s talk about that. I’ve officially cut my list down to 10; in no particular order it’s Syracuse, Georgetown, Michigan State, Duke, Notre Dame, Villanova, Texas, Indiana, Louisville and Washington. It wasn’t easy to get to 10, but my family and I went through it and weighed things out and figured out that these were the schools that fit me best and the schools were I could see myself playing. The coaches that made it were obviously pretty happy; I actually got a call from a coach and it sounded like they were having a party in the background after they heard they made it. I think after Peach Jam I’d like to get the list down to five and schedule my official visits. I’d love to have a decision out of the way before my senior season starts so I can concentrate on playing and nothing else basketball-wise. The best part about the process is building the relationships with the coaches; just being able to talk to coaches that are like celebrities is still cool to me. Like Coach K compared me to Elton Brand and Coach Izzo told me that I fit everything they do and that I’m a once-in-a-lifetime type of recruit for them. That kind of stuff just makes me want to work harder to live up to that praise and even surpass it. It’s good to be out of school for the summer! At the same time, though, I know that time flies and I know that before I know it I’ll be right back there getting ready for the season so I just try and enjoy everything that I’ve got going on right now. I head out to Colorado Springs next week to tryout for the USA Basketball’s U17 team and I’m excited about that. I know the competition is gonna be intense, but I’m just ready to get out there and give it everything I’ve got. I know it’ll be a great experience for me. I definitely listen to music before games and the guys I’m listening to the most are Drake, Lil Baby, Gunna and I listen to reggae as well. I’m part Jamaican so that’s just my type of music. Popcaan is my favorite reggae artist I’d say. OK, guys thanks again for reading my blog! I’m looking forward to keeping you guys updated through my blog from here on out so check back soon for my next entry. “I believe people who know me understand those regrettable actions do not reflect my values or who I am,” Trea Turner said in a statement. 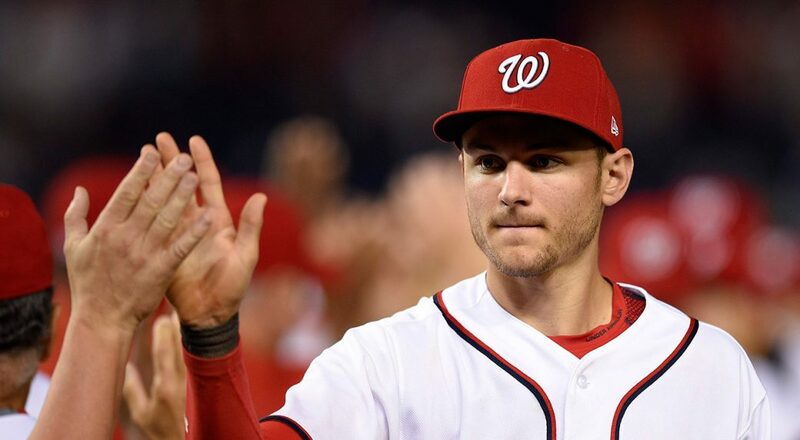 WASHINGTON — Nationals shortstop Trea Turner apologized Sunday night for some years-old homophobic and racially insensitive tweets, becoming the latest in a series of major leaguers to address offensive language they used on social media. The tweets surfaced hours after Washington’s 5-0 loss at Miami. The posts are from 2011 and 2012. Atlanta Braves pitcher Sean Newcomb also apologized Sunday for racist, homophobic and sexist tweets he sent as a teenager, calling them “some stupid stuff.” Major League Baseball dealt with a similar situation this month involving Milwaukee Brewers reliever Josh Hader on the night he pitched in the All-Star Game. Mike Rizzo, the president of baseball operations for the Nationals, said he spoke with Turner about the issue. “He understands that his comments — regardless of when they were posted — are inexcusable and is taking full responsibility for his actions,” Rizzo said in a separate statement released by the team. Thursday’s opening game of the FIFA World Cup was good not only for the host country but also for a supposedly clairvoyant cat. His name is Achilles and he lives in the State Hermitage Museum in St. Petersburg, Russia, where his usual duties include lazing around in between the odd attempt at rat catching. During the monthlong soccer tournament, however, Achilles is taking on a different task: making World Cup predictions by choosing between two bowls of cat food, according to the Russian news agency Tass. Achilles picked Russia over Saudi Arabia in the opening match. Then, the national team did their part to make him look good (not that that was their priority). The cat is deaf and Hermitage officials suggest that gives him an advantage since he’s not easily distracted when making predictions, according to Reuters. The 2018 World Cup isn’t the first go-around for Achilles, who correctly predicted the outcomes of three out of four Confederations Cup matches played in St. Petersburg last year, including the opening and final matches, Tass reports. There was complete disbelief from German fans as they watched South Korea push their team out of the World Cup. At a public viewing area in Berlin, thousands of football supporters sobbed in absolute shock that their team will now head home from Russia. The last time Germany was eliminated from the First Round at the World Cup was in 1938. But this is the first time for them, when the First Round has been in a group stage format.